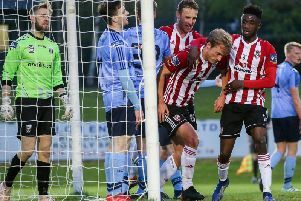 DECLAN Devine believes Derry City's signing of Institute skipper, Michael McCrudden is 'a marriage made in heaven' as the Brandywell club confirmed the end to the long-running transfer saga this afternoon. The top rated striker, who has netted an impressive 19 goals for Institute in the Irish League top flight this season, has signed an 18 month pre-contract agreement with the Candy Stripes and will join the club at the end of June as the deal finally reached a resolution today. It's still hoped the club could yet come to an agreement for the player - whose contract with 'Stute expires in June - before the close of the League of Ireland transfer window on February 22nd but Devine is just delighted to finally get his man. "It's a pre-contract," confirmed Devine. "I think a lot of clubs, both north and south wanted to sign Michael. He's a player I've had a lot of discussions with from the day and hour I was given permission to speak to him from the 1st of January. "It's always been very positive. He knows what we want to achieve at the football club. I know what he wants to achieve in terms of going completely professional. I feel it's a marriage made in heaven and something that can work for a longer period. We look forward to getting Michael into a Derry jersey and it's something the fans can be really happy about. We look forward to working with him in the summer," he added. McCrudden (27) was present at Derry City's press conference at the City Hotel this afternoon where Devine announced THREE new signings including the club's first Argentine representative, Bernardo Bruna who spent five years in the youth ranks of La Liga giants, Real Madrid. Derry City boss, Declan Devine pictured with Michael McCrudden who has signed ab 18 month pre-contract with the club. Defender, Darren Cole and ex-Bohs striker, Eoghan Stokes completed the trio. And McCrudden is excited to be involved as he looks forward to finally pulling on the Candy Stripes jersey again. "It's great to get things sorted and know now that I'll be playing for Derry for the next couple of seasons," said the striker. "I just can't wait to get going. I don't really like sagas like that I would rather have got something sorted straight away and that would be it over and done with." And the Top of the Hill man hasn't given up hope of being available to start Derry City's 2019 Airtricity League campaign in 10 days time, should Derry agree a fee with 'Stute. "I could see Institute's point of view, trying to get a fee for me but hopefully they get sorted and the clubs can come to an agreement. If not I'll go at the end of the season in July and start with Derry then. Michael McCrudden has signed a pre-contract with Derry City. "I've been playing at the Brandywell all this season and the full-time aspect of it I'm looking forward to the most. I'm looking forward to training every day. I love football and love training. "When I heard Derry coming in for me I thought it was a great opportunity. I've played the best football of my life at 'Stute and loved every minute of it. Still I'll go to all the games I can on a Saturday and watch them play. I can't wait to do that. I'll be able to go as a fan now. "But I felt the time was right now to come and test myself with Derry in the League of Ireland."